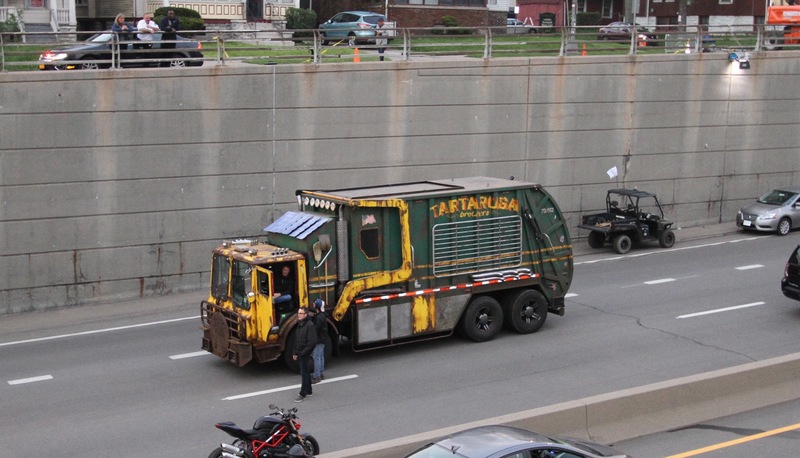 (May 18th, 2015) This past Sunday at 6am saw the official wrap of 2nd unit stunt photography for Teenage Mutant Ninja Turtles II on the Kensington Expressway in Buffalo. Legendary Stunt Director Spiro Razatos (Captain America, Back to the Future) spent 12 nights filming various stunt sequences which will make up the the first major action sequence in the film. The Buffalo Niagara Film Office orchestrated the cooperation of the New York State Department of Transportation and the City of Buffalo for Paramount Pictures to close both inbound and outbound lanes of the 33 from Elm Street to the 198 ramp from 7pm to 6am to allow for the filming. Helicopters, Motorcycles, and a specially outfitted Teenage Mutant Ninja Turtle garbage truck all played into the elaborate sequences filmed on the 33. 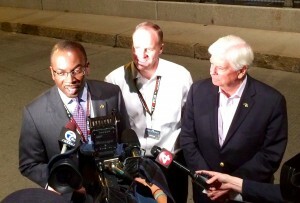 Buffalo Mayor Byron brown addresses press from the set along with NYS Senator Tim Kennedy and MPAA Chairman and former US Senator Chris Dodd. Over 250 crew members worked on this project which will create an estimated 7 Million dollars plus in local economic spend according to Empire State Development. “After two weeks of car chases, explosions and wild helicopter rides, the Turtles’ exciting shoot in Buffalo has officially wrapped,” said Empire State Development President, CEO & Commissioner Howard Zemsky. “Thanks to the Film Production Tax Credit Program, and the ten percent expansion on labor expenses for upstate productions, TMNT 2 has contributed millions of dollars to New York State’s economy. In just two short weeks, next summer’s blockbuster provided a tangible boost to Buffalo’s businesses and raised the city’s profile as a great place to shoot a major action movie.